We've read two very good biographies this week that I'd like to share with you. The first, Alexander the Great: Ruler of the Ancient World, was a book I ordered simply by searching for books on this topic on Amazon. 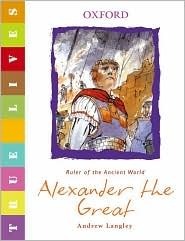 It got very good reviews, and I knew we wanted to go a little more in depth with Alexander than Volume 1 of Story of The World goes.... this book was just perfect! I'd recommend it if you're studying Alexander the Great. I got a wonderful idea last year from Heather at Blog, She Wrote. She suggests leaving books you'd like the children to read just setting around your home in prominent places. I left this one sitting on our kitchen island (hey, they have to go there for meals and snacks, so eventually they'd see the book) and my daughter picked it up and started reading. At that point I invited the children to the sofa and we read it together - perfect!! The second book was given to us by a retired woman in our church. She loves my children and brought me a bag of things for me to use with them. She had bought this book at a museum in Atlanta when a Georgia O'Keeffe exhibit was in town. I have to tell you - I've fallen in love with O'Keeffe's works and would like to learn even more myself. My Name is Georgia is a beautiful, simple story told through the artist's eyes. This point of view really intrigued my children. We read the book out loud on the way home from church and by the time we were in the door we had to Google some of her works. I need to see if our museum in Atlanta has some of her works because I would love to see them. I hadn't planned an artist study for this week, but this one was thrown in my lap, so we ran with it. I found this great activity which we will do this week on fun Friday. General read-alouds this week include dad finishing Shiloh Season (kids are loving this! ), mom reading The Adventures of Pinocchio with GMan, and we are still reading The Bronze Bow - oh, that is a marvelous book! Our book on CD is nearly finished - Peter Pan - we are thoroughly enjoying that as well. What are you reading aloud this week? Visit Amy, at Hope is The Word to link your post!